Elections get dirty and this one is no exception. As the campaign comes down to the wire, policy and politeness have been cast aside. Stockwell Day's "agenda of respect" has degenerated into name-calling and innuendo from all directions. Amongst the invectives that are flying around are those pertaining to Day's religious beliefs. Now, in fairness to him, he did make the strength of his faith clear from the start by declaring that, as leader of the Canadian Alliance, he would rest on Sunday. But more recently, concern has been raised that his values may foster a hidden agenda on serious issues such as abortion, the death penalty and anti-Semitism. Day has responded defensively, accusing the media of "yellow journalism" and the other parties of smear tactics. In a tone of rationality, Joe Clark instilled the sobering reminder that questions about a party leader's religious beliefs are legitimate grounds for discussion. "All of us in public life have to be judged by what we believe, what we do, how we perform," he said. The real concern for voters shouldn't be whether a leader is religious but rather how his or her beliefs may affect performance and policies. On that basis, Day's religious values should spark concern for Canadians. Based on his fundamentalist approach to Christianity, he is bound to believe that his values are God's values (and vice versa). It's a logical progression for him to think that the only good laws are those that agree with his values. The Puritans did it, Prohibition was based on it and the "Religious Right" is inspired by it. Day is their "man," their best hope for establishing (some would say re-establishing) a country based on Christian principles. For Day and his followers, when push comes to shove, God takes priority over Nation. The other party leaders have taken strong exception to Day's religious stance. 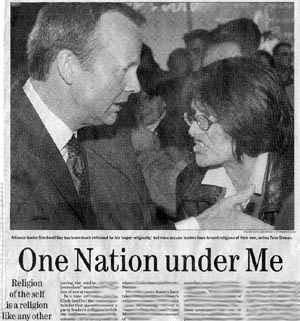 NDP leader Alexa McDonough called it "super-religiosity," and Prime Minister Jean Chretien warned of "dark forces." What disturbs me is that both the Liberals and the NDP fail to recognize the extent to which they are inspired by a modern form of religious belief - worship of the Self. This adoration of a consuming, narcissistic Self which wants everything "my way" is no less morally opinionated than is the Bible thumpers' adoration of God. While Day might put God above nation, those prone to this secular faith put the diverse wants of the individual over the unified good of the country. Acting as if they were the anointed, they promote a vision based on cosmic justice, in which all are not to be judged by the same rules or standards, and in which therapeutic principles promise to heal society of all violence, ignorance, anger and despair. They are the ones who gave us equality instead of quality, individual rights without corresponding responsibility and exaggerated expectations without obligations. They abandoned character building in favour of self-esteem and rewarded whining instead of backbone. They have undermined the role of parents by undermining discipline and establishing surrogate parenting under the name of child protection. They have isolated men from women, depicting male-female relationships as violence-prone. They have taught us that when things don't work, there is no need to assess our own shortcomings. And, with their assistance, we have learned how to blame others, all of society and even past generations. They have opened the way for us to litigate our unhappiness and set up vast systems of counseling and compensation to "heal" our emotional "wounds." We live in perpetual dissatisfaction. Canadians have become consumers, wanting more and more and more to make us happy. Lost in this cult of the Self is any sense of honour, respect, duty or national pride. As Herman Melville once put it: "We (have) become sad in the first place because we have nothing stirring to do." Only the Bloc and the Conservatives offer anything close to stirring. But unfortunately for the rest of Canadian, Bloc leader Gilles Duceppe, with his calls for sovereignty, rouses only the spirit of the Quebecois. As for poor Joe Clark, he touches some of us, myself included, with a nostalgic longing for a bygone era when a nation could be governed by reason. Alas, he is a "dinosaur," a statesman and a certain loser. What I long for is a national ideal lesser than God but larger and more enduring than any individual citizen. As election day approaches, I feel caught between two groups of "true believers"; the moralists who take their orders from God (as they perceive him) and the naive idealists who, taking "The Word" of psychologists, sociologists and feminists, lead us further and further astray. We have leaders who see visions but not one of them, it seems, has a vision of Canada.